We provide you and your pets with emergency service for critical illness or injury during our regular consulting hours. We hope your pet never needs us for an emergency however, common emergencies relate to car accidents, heart conditions, poisoning and a range of injuries. Where possible, if you are able to ring us before you start driving to the clinic, our team can prepare for your pet's arrival. Upon arrival, your pet will be assessed by one of our staff members and then we will start treatment as appropriate. We will aim to provide an estimate of the costs involved with your case, however, please be aware that with emergency procedures costs can vary depending on what services and treatments are required. We will keep you updated regularly during the course of your pet's stay in hospital. In some cases we may need to refer to a veterinary specialist centre or 24-hour emergency facility. Would you know what to do if your pet ate something it shouldn't or suffered a fracture? In an emergency situation, effective first aid can minimise injury and even save lives. Knowing what to do makes all the difference. Clients of Roleystone Animal Hospital now have access to an important free app for their phone called First Aid for Pets Australia! It has been designed specifically to be easy to use in emergency situations, featuring first aid tips for over 130 conditions that can potentially affect cats and dogs, from toxins to trauma and medical emergencies. It provides simple, step-by-step guides to provide appropriate first-aid. Additional information on causes, clinical signs and treatment is included. Our contact details and a map are included, so that you won’t even need to look up our number – and you can find us when you need us quickly. The app also contains a list of all 24 hour veterinary emergency centres in the state. 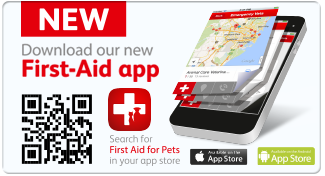 To download First Aid for Pets Australia, search for it on the iTunes App Store, Google Play store. If you have any feedback about the app (including what you like, as well as anything you don’t like) please let us know. Your feedback will help us tailor the app to serve you and your pets best. Email us on roleystonevet@gmail.com and let us know what you think!